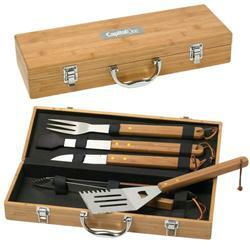 Custom BBQ 5 Piece Deluxe Bamboo Set in a Bamboo case laser engraved with your logo. 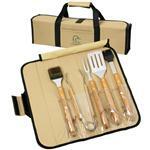 This eco-friendly barbecue set includes spatula with cutter, tenderizer and bottle opener, tongs, cutting knife, silicone basting brush and fork in an all natural Bamboo case. Need assistance with your choice?? Our knowledgeable staff is a phone call away. 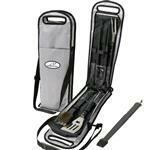 Great for fathers day, promotions, employee awards, and executive gifts! Dimensions: 3 1/8" h x 18 1/8" w x 6 7/8" d.
Typical Imprint Area(s): Laser Engraving on Aluminum Plate. Available Imprint Options: Price Includes Laser Engraving on Aluminum Plate. Using only the best FDA compliant materials and all natural Bamboo case. Wooden Handled Utensils Recommended "Hand Wash" Only. 8 pieces per box at 29 lbs.